Most people are aware of electric guitars and electric pianos, but these aren’t the only traditionally acoustic instruments that have gone digital in the modern era. 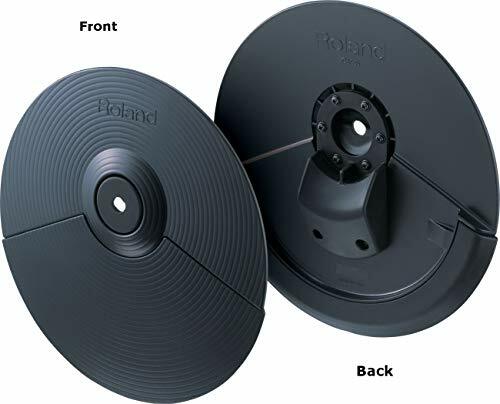 Percussionists now have the option of buying electronic drum kits, the best-known of which are the V-Drum series from Roland. Just like with acoustic drums, the cymbals on an electric kit are an integral part of the groove and an important color in your overall tonal picture. Which cymbal is right for your purposes will depend largely on whether you use your electronic drums for practice or performance. As with acoustic cymbals, you can find electronic hi-hats, ride, and splash cymbals; unlike acoustic cymbals, you can also find some models that reproduce the sound and feel of two or more acoustic types, saving you space on your rack and in your budget. If you’re putting together an electric drum kit, check out the options on the list below, which represent 4 of the best electronic cymbal options on the market. 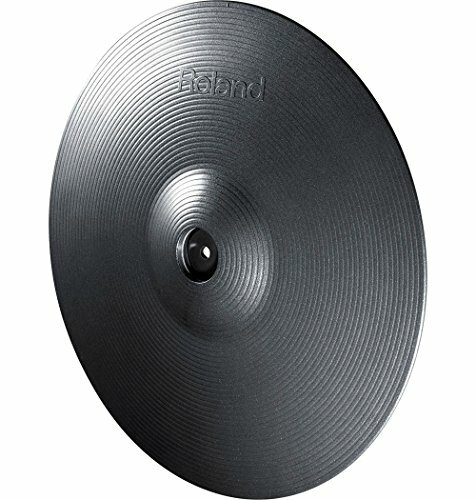 If you’re looking for the ultimate V-Cymbal ride, look no further than this 15 inch model from Roland. It gives you all the features you’ll need out of your ride cymbal, including a choke-compatible edge, positional sensing, and three trigger zones (edge, bow, and bell) to give you the full range of sounds and responses you can get out of a non-electric ride (see full specs). 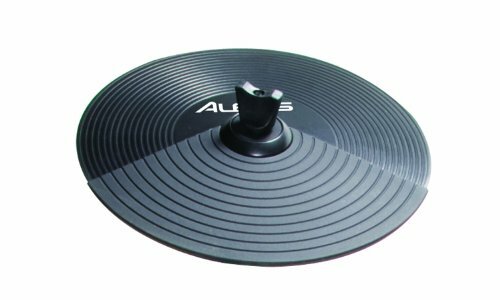 With a high level of dynamic sensitivity, you can capture the true dynamics and feel of your playing, whether you’re going for a hard strike or a more sensitive swish of brushes as an accent in a ballad or softer tune, making it perhaps the most expressive V-cymbal you can find on today’s market. 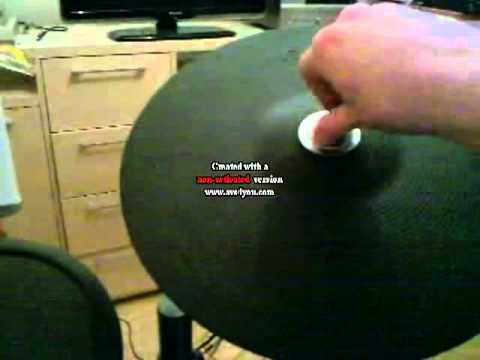 The realism of the hi-hat pad has traditionally been one of the main complaints of V-Drum players in the past. 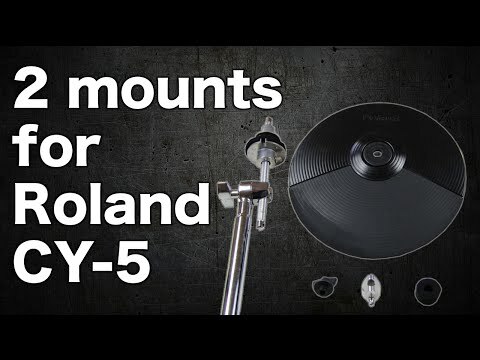 With their CY-5 cymbal pad, Roland provides a solution for this problem, giving you a realistic and crisp hi-hat sound while also having the potential to function as a splash, crash or other peripheral cymbal on your V-Drum kit. It has a 9.5 inch diameter (see full specs), giving you a 12 inch playing zone with separate edge and bow triggering. It also uses swing movement to give it a more natural feel. The combination of versatility and true-to-life sound and performance makes the CY-5 one of the best electronic cymbals for any drummer looking for a V-Drum cymbal that’s also relatively affordable compared to the majority of professional V-Drum equipment. The soft rubber used in its construction gives you a realistic feel, both in the initial strike and in the rebound, but it’s the sensitivity of the Alesis DMPad that’s its most impressive feature. It responds to the velocity of your strike, giving you more control over your dynamics and overall sound, while also giving you a dual-sensing trigger zone that lets you trigger different sounds from the head than from the rim. This gives you the option of incorporating rimshots and rim clicks and can also be set to provide auxiliary percussion sounds like wind chimes, gongs, or cowbell. Not only does it give you great sound versatility, then DMPad is compatible with nearly all electronic percussion devices on the market, giving it the extra versatility to work with your kid, whatever brand you use. 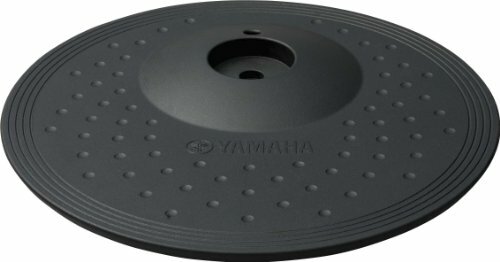 Unlike most cymbal pads in its price range, the PCY100 gives you three striking zones—at the edge, the bow, and the cup—letting you successfully re-create the unique sounds produced by the various areas of a standard cymbal. It’s also very responsive across all three zones, sensitive to subtle dynamic shifts and other extended cymbal sounds, like chokes and strokes. The feel of this pad is designed to be very similar to a standard metal cymbal, from the way the cymbal moves on its stand to how your stick bounces off its surface, making it an excellent choice for drummers accustomed to acoustic kits. 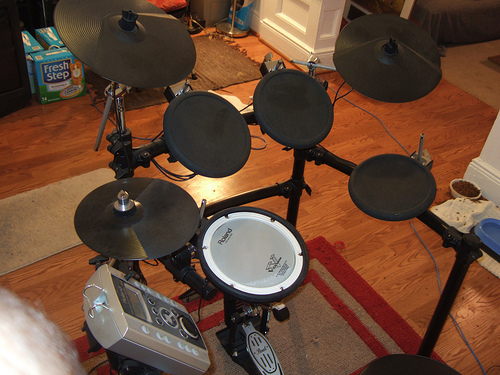 Electronic drums give players a lot of advantages over an acoustic kit. The most obvious is that of dynamics. Acoustic drums are an inherently loud instrument, making it difficult to play or practice at lower volumes without altering your technique. Electronic drums, on the other hand, make very little acoustic noise and have a volume control like an electric guitar, giving you complete control over your dynamics. This is not only ideal for practice situations but can also be helpful for gigs in small venues or other situations where you need a lower volume but don’t want to switch to brushes. Another advantage of an electronic drum set is that it opens up a greater variety of tonal options. If you plan dance music, funk, or any other genre that’s influenced by electronic sounds, the array of effects at your disposal on an electronic kit can be a major benefit. It’s also helpful in the recording studio and for composers, letting you connect your kit to computers or samplers to generate MIDI tracks—something acoustic drums simply can’t do. How many trigger zones you need on your cymbals is, again, a factor of what you plan to use the kit for. If you’re only using them as a way to practice at a lower volume, it’s the feel of the kit more than the sound it produces that will be most important to your purposes. Buying a cymbal with multiple trigger zones and extra sound effects wouldn’t be a problem, but is likely also not necessary; a lower-priced cymbal with fewer sonic options will suit your purposes just fine. If you plan to use your electronic drums to perform, however, having two or three trigger points on the cymbal is more of a necessity. Especially when it comes to acoustic ride or splash cymbals, the different areas of the cymbal give you very different sounds and colors when you hit them, and capturing that in an electronic context is important to making the kit sound truly realistic. In performance situations, you may also want to get an array of the best electronic cymbals to represent the various cymbals that would be part of an acoustic drum kit, even though many of the models above can be used to produce a variety of different cymbal sounds. Using electronic drums can open up a lot of new sounds and textures that just aren’t available in acoustic formats, and cymbals with three trigger points give you more opportunities to use multiple sounds and textures without stopping to change the settings. Good luck!